We were very pleased that the Madrona Newsletter, the publication of one of Seattle's lively neighborhoods, decided to interview our author and Illustrator Sandra Darling, who lives in the Denny Blaine/Madrona with her family. By Kevin Lundeen, 34th Ave"
"This is Seattle!” That is what Cooper Edens (of If You’re Afraid of the Dark, Remember the Night Rainbow fame) said to Sandra and Harold Darling, driving by the Denny-Blaine Lake Park shelter on E. Denny Way in 1993. Madrona and Denny-Blaine residents have Edens, himself a Rainier Beach native, to thank for bringing the Darlings to our little corner of Seattle. Shortly after Eden’s tour, the Darlings loaded five semi-trailers in San Diego with their unique collection of antiquarian books, illustrations, and ephemera, packed up their family, and were bound to their new home on High Lane in Denny-Blaine. “Carl bought the house,” claims Sandra. Carl is a dog, in case you didn’t know. Sandra Louise Woodward Darling is Carl’s creator: an illustrator and author of children’s books and better known by her pseudonym, Alexandra Day. She is loved the world over for her sumptuously illustrated series of Carl books, the first of which was Good Dog, Carl published in 1985. The bibliography on www.gooddogcarl.com lists 24 Carl books, most recently Good Dog Carl and the Baby Elephant published last year by Darling’s own publishing house, Laughing Elephant. Laughing Elephant is a publisher dedicated to “producing and distributing gift books and paper products that capture the values of past times. 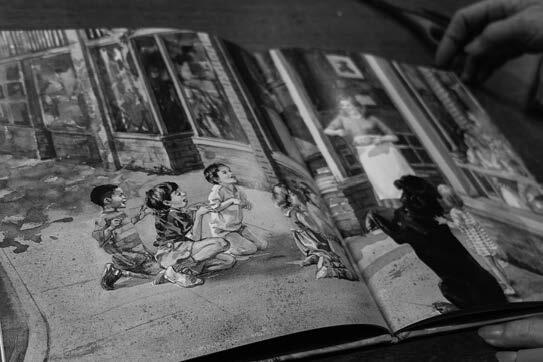 Darling shows some of her original Carl watercolor illustrations used in the books. Those values of times past are nowhere more evident than at the Laughing Elephant headquarters at 3645 Interlake Ave.N. in Wallingford. Dogs Carl and Cleo sunbathe on golden rugs laid atop a Persian blue floor and in front of a cupboard filled with vintage games and toys. 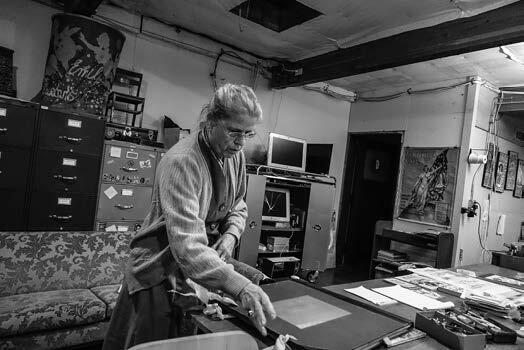 The feeling of the place is that of an old printing shop—paper, drawings, trinkets, and books strewn everywhere with the amber glow and old-school smell of honey-colored wooden cabinets permeating the narrow and irregular passageways. No wall space is unadorned—ancient posters overlaid with printed art and illustrations create a mosaic effect like the haphazard overlapping carpets in an Arabian bazaar. This shop/office/museum/warehouse/ library is a trove of classic artwork spanning the last two centuries, including contemporary and reproduction pieces created by Darling and her family. There are drawers and drawers of illustrated ephemera. Matchbooks, cards, bridge tallies, perfume labels, brochures maps, fliers, menus—anything that has ever sported any artwork and is about four-score to a hundred years old is in those drawers. Then there is the library—literally thousands of titles, mostly pre-WWII. Again, anything with an illustration is there. The books are organized, not by author, but by illustrator. There are also volumes of antique illustrated periodicals for juveniles from the late 1800’s and early 1900’s—St. Nicholas,Child Lore, Chatterbox, Blackie’s, and many more." "Darling and her late husband, Harold Darling, spent a lifetime accumulating this unique and vast collection of visual inspiration. It’s been fuel for the whimsical businesses they have created with names like Green Tiger, Sign of the Sun Bookstore, The Unicorn Theatre, Blue Lantern, and Laughing Elephant and it is how they have enticed creatives like Cooper Edens to work with them. In addition to authoring, packaging, and publishing books, they produce cards and other printed products using vintage artwork curated from their collection. Darling showing some prized illustrations from her collection. These century-old illustrations are from a famed British illustrator, Arthur Rackham. Sandra Darling paints from reality. Being honest with children and allowing them to put their own stories to her illustrations are among her lauded hallmarks. Her dogs are her models (there have been five family dogs through the years that have played the Carl modeling role) and I can attest to the current Carl’s willingness to pose for her however she directs him. He did so at her direction when I was photographing him. Dark black-eyed dogs are notoriously hard to photograph, but Darling claims that they are the easiest to paint. 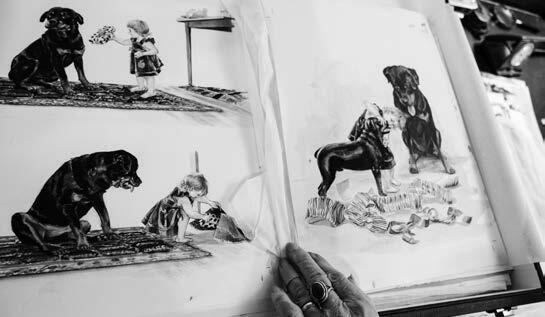 Darling usually involves children in her illustrations and these, too, she paints from life. She will get local kids to act out the scenes she wants with Carl. Some of her illustrations have featured storefront scenes in Madrona and grassy hillsides in the Arboretum. One of Darling’s Madrona business district scenes. Harold was also an author of illustrated books, his last two being the whimsical A Field Guide to Well Dressed Animals and the inspirational Happiness. From the endnotes of Happiness, “We selected the forty-two images in Happiness from among hundreds of possibilities because they represented a wide variety of happiness. … We share in delightful circumstances and awaken to the simple delight of just being. … the selected quotations, some by the author, most gathered by him from a lifetime of reading." Laughing Elephant sells their books, cards, and artwork through retail outlets, on the web at laughingelephant.com, and now also in a retail shop at their headquarters in Wallingford, where all sorts of whimsical and delightful items are on sale. When you visit, make sure to pet the Green Tiger in the entryway and, if you are lucky, Carl might even greet you at the door.